High Strangeness: Best UFO books?? 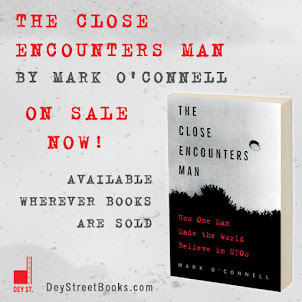 Hi Mark, I loved your book, and I have mentioned it to several friends only to be met with that look you get when you admit that you believe that UFOs are more that just total nonsense, so I'm sure it's not easy to promote your book. Would you ever consider compiling a reading list for people who share your point of view on the UFO phenomenon? I just read "Passport to Magonia", and "Operation Trojan Horse", but I need to be pointed in the right direction. First of all, thanks for the compliment, and thanks for trying to get your friends to see the light! Given them time; they might come around. It is true, though, that it's not easy to promote the book. 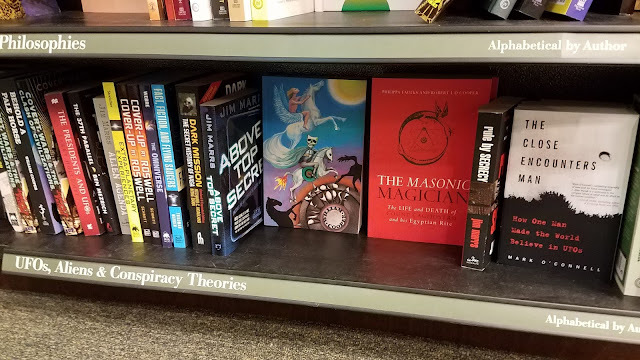 Just yesterday I was at a big Barnes & Noble and found my book in the far back corner of the store, on the bottom shelf of the last bookcase, in the "UFOs, Aliens and Conspiracy" section. Now, I will cut B&N some slack, as The Close Encounters Man was displayed cover out rather than spine out, so that's good, but still, it's not great real estate for a book that's intended for a mainstream audience. Well, I am right next to Jim Marrs, which is cool. But a few minutes later I was perusing the "Science" section, located in the more reputable part of the store, and I came across a startling discovery. 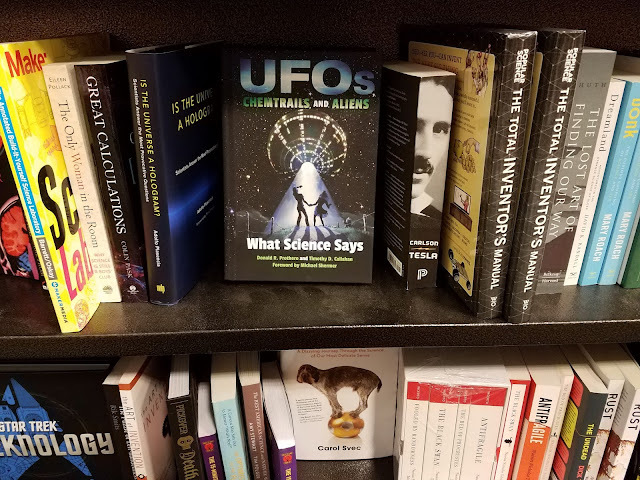 There, right next to a biography of Nikola Tesla and just a few feet from Hidden Figures and the latest from Bill Nye the Science Guy, Mary Roach and Neil deGrasse Tyson, is a book called: UFOs, Chemtrails, and Aliens: What Science Says. I'm not saying that this book doesn't belong here, because it does (and it looks like an interesting book, although, I confess, I didn't buy it). I'm just saying my book has an equal claim to being in the "Science" section. And the "Biography" section, for that matter. At times like this I wonder whether my subtitle should have read: "How One Scientist Made the World Believe in UFOs," instead of "One Person." This is one reason a book like mine can be a challenge to market. But it makes me all the more pleased that my next speaking engagement is taking place as part of the Wisconsin Science Festival -- they got it right! That said, this reader already made a good choices with Jacques Vallee's Magonia and John Keel's Trojan Horse, and I would suggest reading anything by either of those two gents, because they are among the most entertaining UFO writers who ever put pen to paper. Also, even if I hadn't written a book about him I would be obliged to recommend Dr. J. Allen Hynek's books, The UFO Experience, The Edge of Reality and The Hynek UFO Report, because they are so good. I also love John Fuller's two masterworks, The Incident at Exeter and The Interrupted Journey. To be clear, I don't always agree with everything these writers have to say, but I did find these books all engaging and entertaining for a variety of reasons. Case in point: I recommend Communion simply because it is so gloriously wigged out. How about you? What books would you have on your list? I would add "Mirage Men" by Mark Pilkington in order to add some balance to the list. 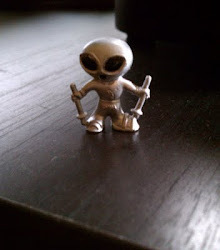 It's well worth reading because one ought to approach the topic of UFOs with some objectivity. In terms of a skeptical look at the phenomenon, this is the best of them and there's plenty of food for thought in it. Not all UFO skeptics are just being "killjoys", they make valid points that should be considered, at least by those who who don't approach UFOs as a religious belief but rather with open minds. As for B&N, I suspect for less that superstar authors it's a pay for play situation as to where a book is shelved in the stores. If the publisher ponys up enough, the book goes on that table in front of the door, if less than top dollar it's shelved with the subjects that are the most accessed. If nothing, it goes on a bottom shelf in the back of the store. This is how capitalism works. Sigh. Hi pg, I like your suggestion of "Mirage Men." That's a book I've always been curious about, so your recommendation has inspired me to read it. My editor has assured me that HarperCollins has instructed bookstores to stock my book on both the Science and the UFO shelves... some of them don't seem to have gotten the memo! I hope that's all it is and not literary criticism on the part of individual store managers . . . I think Leslie Kean’s book deserves to be on the list as well. Glad you mentioned Ruppelt's book! It's an essential. Woops, just realized you did mention Leslie Kean's book in the text rather than the list. Her book and yours are the 2 most academic and non-biased books on the subject of UFOs. Tht's a huge compliment, thank you!